Sarah Milkovich, a member of the science team for NASA's Mars Reconnaissance Orbiter, guides you through an orbital view of the Curiosity rover as well as its heat shield, parachute, backshell and sky crane wreckage. NASA's Mars Curiosity rover is in fine shape, but the sky crane that lowered the car-sized, 1-ton craft to the Red Planet's surface is not looking so good. 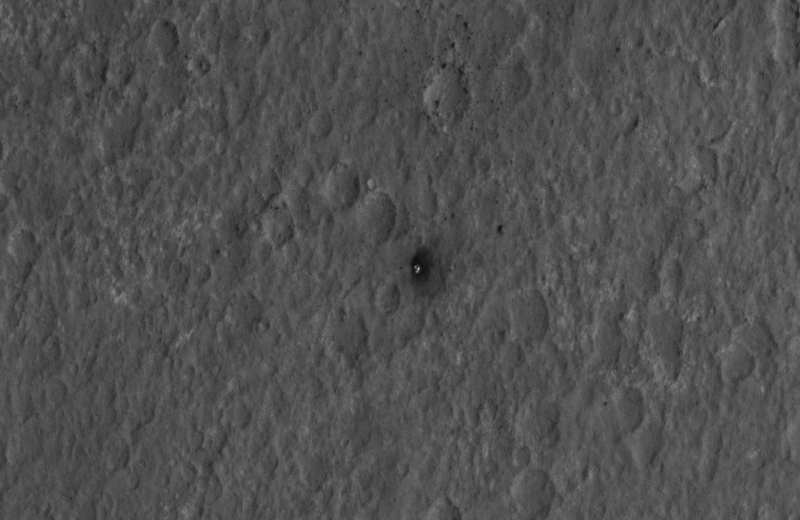 That's plain to see from the "crime scene photo" provided by Curiosity's high-flying sister probe, Mars Reconnaissance Orbiter. The orbital image, released today, not only shows Curiosity and the sky crane, but the rover's parachute, backshell and heat shield as well. 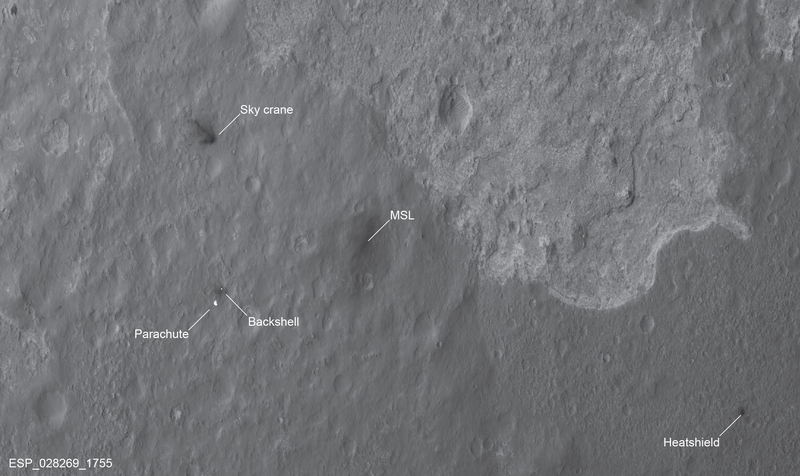 The picture was snapped on Monday night (Pacific Time), about 24 hours after the sky crane executed a perfect maneuver to lower Curiosity to its landing spot in Gale Crater, then flew away for a planned crash landing. Sarah Milkovich, a member of the orbiter's science team, unveiled the latest jaw-dropping image during today's news briefing at NASA's Jet Propulsion Laboratory in Pasadena, Calif. The debris scattered around the rover documents each step of the Mars Science Laboratory's nail-biter of a landing sequence. "It's like a crime scene photo here," she said. The heat shield is visible toward the lower right corner of the scene, which is part of a larger strip of imagery acquired by the orbiter. NASA's schedule for Curiosity's landing called for that disk-shaped part of the spacecraft to be thrown off two and a half minutes before landing — and in fact you can see the shield falling away in a video released Monday. 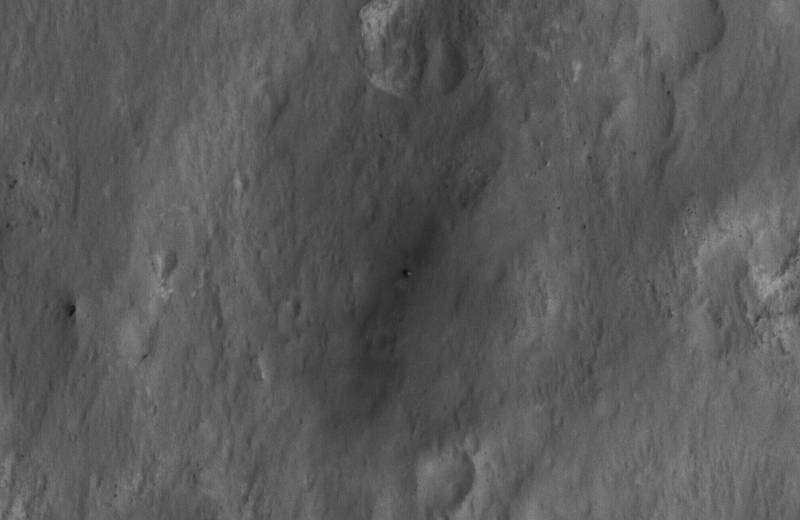 Milkovich said it landed about three-quarters of a mile (1,200 meters) from the rover's landing site. Curiosity's backshell and its attached parachute are spread out southwest of the rover, about four-tenths of a mile (615 meters) away. Those pieces were jettisoned from the spacecraft about a minute before landing. You can see them still attached to the rover in a different picture taken by the orbiter during Curiosity's descent. The sky crane was the last piece of the landing puzzle: It was a rocket-powered platform designed to reduce the descent velocity to a near-standstill, and then drop the rover to the ground on the end of three strong cables. When the rover hit the surface, the cables were cut with explosive charges, and the sky crane flew itself away to avoid crashing on top of the rover. 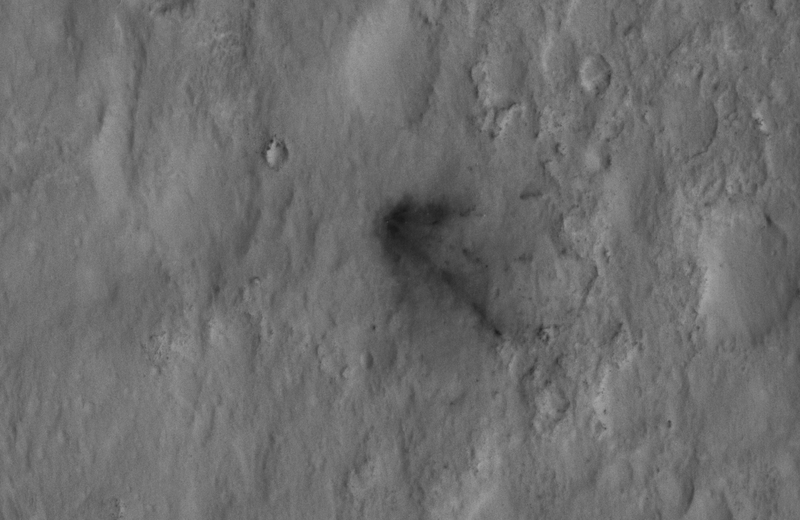 Mars Reconnaissance Orbiter's picture shows the dark streaks left behind by the crane's crash, about a half-mile (650 meters) to the northwest. The blast pattern suggests that the crane hit the dirt obliquely, Milkovich said. This view shows the whole scene around the Curiosity rover, as captured by NASA's Mars Reconnaissance Orbiter. Click on the image for a larger view, or check out NASA's close-ups for the rover, the parachute, the sky crane and the heat shield. At each site where something landed, the relatively bright material on the surface has been disrupted, exposing darker material beneath, Milkovich said. The pattern of dark and light material around the rover supports the view that Curiosity is oriented along a northwest-to-southeast axis, with the rover's front facing the 3-mile-high (5-kilometer-high) mountain known as Aeolis Mons or Mount Sharp. Some observers noted that images taken just after the landing, by a rear-facing camera on Curiosity, seemed to show a puff of dust rising from a spot northwest of the rover — and they hypothesized that the disturbance was caused by the sky crane's crash. Now the orbital imagery shows that the spot really is roughly where the wreckage is located. A reporter asked Mike Watkins, one of the mission managers for Curiosity's $2.5 billion mission, whether the hypothesis could actually be right. "I don't think you can rule it out, based on this image," Watkins replied. In order to get the shot, Mars Reconnaissance Orbiter had to be rolled to an unusually high 41-degree angle, producing a sidelong view similar to what you'd see from an airplane window. The picture was taken from a height of roughly 186 miles (300 kilometers), yielding a resolution of 15 inches (39 centimeters) per pixel. Future pictures are expected to show the hardware in greater detail. Kenneth Edgett, a member of the Curiosity team from Malin Space Science Systems, said the picture showed three different types of geological formations converging on a point near Curiosity's landing site. "If it were up to me, I would go where those three come together," Edgett said. Nature's Eric Hand provides more detail on Curiosity's potential future route. 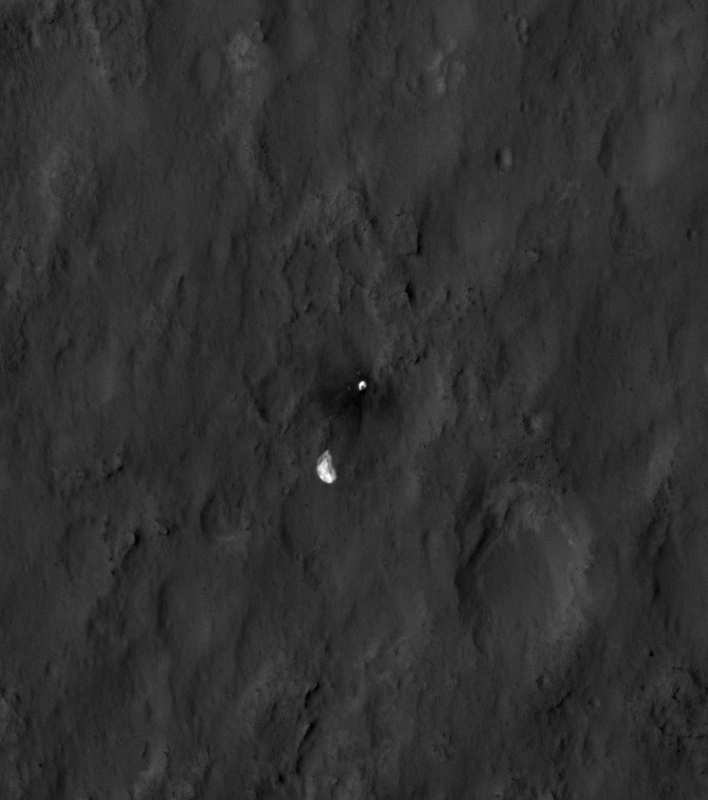 However, mission managers say it's too early to tell exactly which places the rover will visit. There's one place the rover will definitely not visit: the sky crane crash scene. Engineers estimate that there were still about 300 pounds (140 kilograms) of hydrazine rocket fuel left over from the sky-crane platform's 880-pound (400-kilogram) supply when the crash occurred. Mission managers want to make sure the rover avoids having its scientific instruments contaminated by the fuel that was splashed around the impact zone. The Curiosity mission's team for entry, descent and landing evaluates an orbital image that shows the impact location for the sky-crane descent stage on Mars. Watkins said the rover is in good shape. It's already taking lots of pictures and acquiring scientific data with its RAD experiment (which reads radiation levels) and its REMS weather station. Over the next day, mission managers will tweak the REMS settings to get it in better working order, and fine-tune the orientation of Curiosity's high-gain antenna to get it pointing more directly at Earth. By Wednesday, Curiosity's mast should be raised to its full height of 7 feet (2.1 meters) above the ground, which will clear the way for the checkout of the mast's science and navigation cameras. The first high-resolution, 360-degree views of Curiosity's surroundings could become available in the next day or two. Curiosity will be gathering data for at least the next two years, with the prime objectives of unraveling billions of years' worth of the geological record at Mount Sharp and looking for chemical evidence that could show whether or not Mars was ever potentially habitable. There'll be lots of cool pictures ahead, but Watkins said the early pictures are particularly treasured because they show places that have never been seen up close before. "These are the days that people have worked five or 10 years for, going on right now," he said. Update for 5:45 p.m. 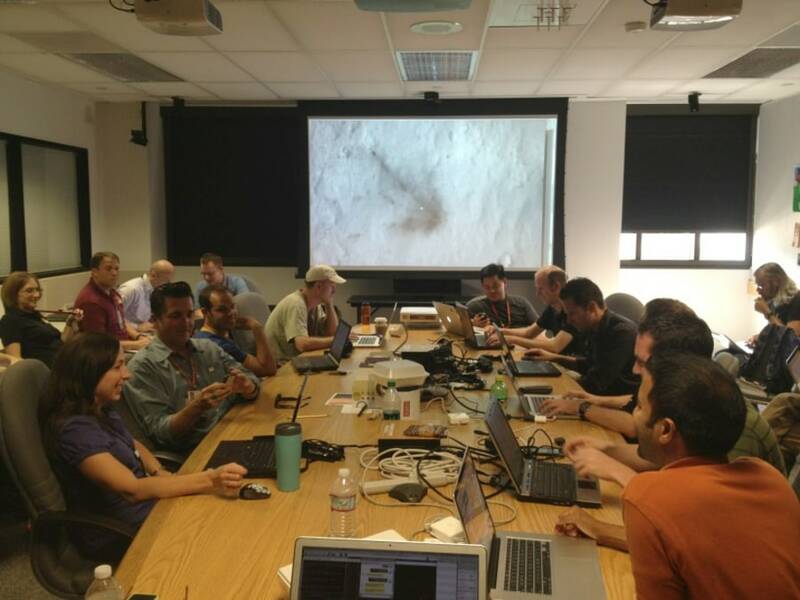 ET: Thanks to JPL's Steven Lee for sharing his picture of the entry, descent and landing team poring over the picture of the sky crane crash site. Lee also reports on the winner of the team's office pool to predict the landing location: Congratulations to entry controller designer Paul Brugarolas.